Have you paused to wonder the reasons for the fears and uneasiness in the United States and around the world, since the recent political campaign and the inauguration of Donald Trump, president of the United States? President Trump’s executive orders have resulted in thousands of protesters across the country and overseas. There are the anguish of Mexico and angst with Australia; panic and fear have gripped America’s immigrant population. Families and children are wailing, traumatized with uncertainty—losing family and separating family members. There is full-scale panic over losing the Affordable Care Act, which many rely on for their healthcare. Thousands of protesters have stirred conversations and are convinced that they are living in a dark and dangerous time. Perhaps a good starting point in wrestling for answers could begin with a sense of history, and this is poignant as we celebrate Black History Month, which underscores the totality of our story. And it is a paradigm which cannot overlook history’s darkest ages for Blacks, inseparable from the slave religion, are entrenched in racism, tyranny, hope, faith, and self-understanding of destiny—the consciousness that there is someone, somewhere who is in control and will bring about better days soon to come. With an apparent rehearsal of history, now captivated all the fears and uncertainties in the United States and as we celebrate Black History Month, the thought of our forebears certainly comes in sharp focus—the tyranny of the Jim Crow laws, the many civil rights marches, so many of our ancestors died risking their lives for us to have freedom today. And with the Civil Rights movement and freedom gained from the struggles, there are still mountains to climb in 2017. Moreover, there is a continuum of learning from history, which empowers as we tell our story at each celebration. Interestingly Dr. James W.S. 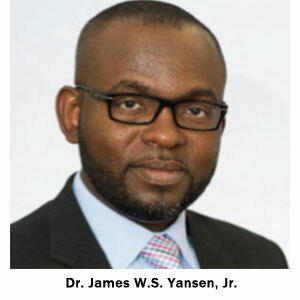 Yansen, Jr., joins in the ongoing conversations. Against the backdrop of the turmoil highlighted above, he has contextualized the unrest, the perplexities, challenges and anxieties, and offers answers to the seemingly endless problems in our contemporary world. He comes with an interesting background, serving in ministry for over 20 years in the Caribbean, United States, France, England, and South Africa, serving as district pastor in Trinidad, West Indies, and assistant professor at the University of the Southern Caribbean, Trinidad, West Indies; pastoral work in Boston, Massachusetts; and taught biblical Hebrew I and II at Boston University. Yansen earned his Ph.D degree, majoring in biblical studies (Hebrew Bible), Boston University School of Theology. His dissertation entitled: “Daughter Zion’s Trauma: Reading the Book of Lamentations with Insights from Trauma Studies.” Also, he earned a Master’s Degree in Sacred Theology (MST), Boston University; Master of Divinity, Andrews University Theological Seminary; and Bachelor of Arts, Andrews University, Michigan. Currently, Yansen is the senior pastor at Faith Seventh-Day Adventist Church, Hartford, CT. Yansen brings to the ongoing conversations strong academics in Biblical—Theological and Pastoral Ministry backgrounds. He uses his skills in these disciplines, extrapolating insights from the Book of Lamentations, shedding light and giving meaning to some of the most gruesome history and experiences the Israelites encountered. Amid the pressing and baffling issues facing the people, there were those who were resilience, recognizing God’s hand in history, holding on in confident expectation of hope, forgiveness, relief from sufferings as they strengthened their resolve through prayer. According to Yansen, his studies and ministries have helped him to develop a love for the Hebrew Bible and got him involved in the Black History movement. Yansen said that he has “always been intrigued by lectures on the Book of Job, the history of the Israelite religion, and how the Israelites lived amidst the world of experiences that crushed around them. “What everyday religion for the Israelites was all about? What religion was for them in their homes, among family members and in their community?” Yansen asked. For Yansen, there are important parallel lessons to be learned from the experiences of the Israelites. For example, in youth ministries, one can develop ministries aimed at helping the youth to understand their humanity and purpose; helping them in their struggles and pain to find the courage to go forward, keeping a focus and enduring to the end. An understanding of Old Testament characters struggling and wrestling with their world, you read some of their violent passages; you see pain and the suffering of innocent people, their ups and downs. When these experiences are applied to individuals and the ministry of the church today, they challenge us and there are lessons to learn. Yansen shared his own experience at Boston University after he completed the coursework for his doctoral program. His major professor passed away. This is one experience all doctoral students wish they would never experience. “My journey to complete my doctorate was confronted with trauma, after trauma with the passing of my major professor,” Yansen said. “I was driven back to the Book of Lamentations. God’s presentation in suffering and Lamentations gave me a voice,” he added. There are five Lamentations of the Book that described the utter misery the children of Israel experienced with the destruction of Jerusalem and Judah. The people experienced acts of oppression, starvation, and low moral, deep spiritual sufferings and distress. Yet in spite of their woes and seemingly abandonment, there was a thread of confident expectation and hope in their deep sorrow that the Lord will forgive and relieve the sufferings as they put forth their resolve in prayer. So for Yansen, the Book of Lamentation gives us a voice and challenges us to translate our sufferings into pure religion. “One is driven to God to express his emotion and is given space to voice his pain and not given an easy answer,” he said. “One senses the reality of God, holding onto God and continuing to pray, holding onto God. This relationship shapes one’s faith,” he said. Who says it would be an easy way? In the struggle there is a cross to bear. “Looking at the cross, we see ultimate suffering and we see a God who transcends suffering, and we see a God whom we can trust. So when we find ourselves oppressed, God comes to our side and identifies with us. There is no victory without struggles, roadblocks and pain. The Book of Lamentations is certainly relevant to our time. There are lessons of history for all ages. And like the Israelites who faced some of their darkest and dangerous times, full-scaled panic concerning the future but ultimately there were those who recognized God’s hand in history and answered God’s call, accepting his hope and a better future. The Book of Lamentations has lessons for everyone today. It challenges us on the importance for our voices to be heard, including the voices of the many protesters telling their stories. I’m goin’ to live with God. Dr. Yansen shares in Christian service with his wife, Nadiège, and children Jedd and Joachim.